Fun fact: Adam Keefe is an actor/writer/fool who loves lemon merengue pie and creepin’ around the Dead Centre of Town! Number of years with DCoT: DC0T is ten years old, and I’ve been here for every one of ’em. Favourite DCoT Memory: In year six, I got to threaten Steve Pirot with a broken bottle in the disused attic of Block 1912, fulfilling a lifelong dream. What you’re most afraid of: The guy who lives in my closet and only comes out to watch me sleep. 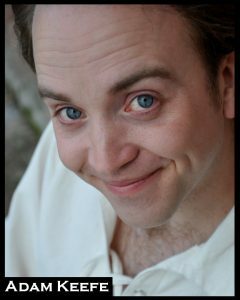 Adam Keefe is an actor/writer/fool based in Edmonton, and loving every weird second of it. Aside from EVERY year of Dead Centre Of Town, Adam works as a clown and physical theatre performer, assisting in the performances and production of Edmonton’s Play The Fool festival. Other projects include his original adaptation of Fear And Loathing In Las Vegas, an exploration of grief and hope in the new work Wind Telephone, and an unnamed new project for next year’s Fringe festival. Happy hauntings!